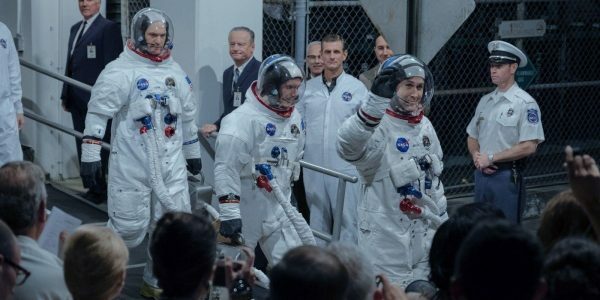 "The price you pay for achieving the impossible"
The 1969 Apollo 11 moon landing has become a story of modern legends and has provided a multitude of storylines for films throughout the years. One of the recent biographical depictions can be found in James R. Hansen‘s book, First Man: The Life of Neil A. Armstrong. The aerospace historian provides a fresh and personal view of the man who was the first to step onto the moon and how NASA strived to win the space race in the 60’s. Put into the hands of Josh Singer, the Academy Award® winning writer for Spotlight and Academy Award® winning director Damien Chazelle (La La Land) who combine their talents to provide a reimagining of this well-documented portion of history. Neil Armstrong (Ryan Gosling) was a Navy aviator, test pilot and aeronautical engineer with a young family who had recently lost their youngest child to cancer. During their time of grief in 1962, he receives a phone call for him to consider being part of the newly founded NASA Astronaut Corps. Armstrong and his wife, Janet (Claire Foy), decide this would be an excellent opportunity for a fresh start. As they move to the training ground for this space exploration atmosphere, they quickly come to realise that each man and their families become a unique community while the world watches their progress. As NASA ventures into new territory for exploration, the realities of the dangers of the testing process and the future space travel cause ever-increasing tensions for the families. From the Gemini to the Apollo programmes, Armstrong begins to prove himself as a respected leader for each step as they get closer to the historic trip to the moon. Over the decade, the tight band of brothers see some of their fraternity die during tests which cause pressure from government officials to stop things entirely. As the pressure mounts on the astronauts for success, the area where things were felt most were in the Armstrong's home, but eventually Neil gets the opportunity of a lifetime to command the historical lunar flight. The question to address at the outset is how First Man measures compared to past space exploration films like Apollo 13 and The Martian. Despite having the same feeling of the historical elements of Tom Hanks’ movie, this is less a drama adventure than an historical depiction of the events around the American space program. This also places it in a different category to The Martian and Gravity, because this is based on actual events and people. Like the groundbreaking effort of NASA to venture into new areas of space, Chazelle and Singer attempt to travel into new territory in filmmaking. The first person style of camera work and the incredible cinematography help to differentiate it artistically. Distinguishing it from The Right Stuff, because it focuses on one man and his life as opposed to multiple historical characters, which makes this more accessible for audiences. This movie does stand on its own as one of the most immersive and personal films within this genre and brings these historical events into this era for the modern viewer. The only challenge will be for people to connect with the central character. Ryan Gosling manages to channel the intensity and focus that is assumed by someone in the original astronauts. A performance that is reminiscent of his role in Drive that required minimal dialogue to convey the message of the film, but does not give much for fans to hold onto. Fortunately, Chazelle has surrounded his lead actor with fascinating characters who add the essential emotional elements to make this film worth engaging. Claire Foy is a standout as Armstrong’s long-suffering wife and provides the necessary dimensions to this film and shows that these men did not operate in a vacuum. The family element becomes one of the centerpieces of this tale and provides that invaluable aspect of sacrifice on the part of the astronaut’s wives. Then to include the colorful and tragic characters of Ed White (Jason Clarke), Buzz Aldrin (Corey Stoll) and Deke Slayton (Kyle Chandler), the film provides this story with the depth needed to make it an excellent choice for this award season.